There are currently 3,358 users on this website. I have been collecting New Zealand used stamps (along with many other things ) for some time and am at the point where the bulk of my needs are for postal fiscal stamps and high value stamps that may have fiscal uses. I am looking for some guidance to avoid buying fiscally used stamps. I will summarize what I think I know below and then ask a few questions. I have borrowed a copy of The Postage Stamps of New Zealand Vol 3 and made copies of the cancellation information I could get from there. It appears that it is very difficult to guarantee a cancellation is postal except for some special parcel or airpost cancellations. It seems that "normal" postal cancellations were sometimes used for fiscal uses especially in small offices. I am not looking for an iron-clad guarantee, but want to avoid all definite or most likely fiscal uses and accept most likely postal uses. Anything with a crown, stamp office, registry, duties, dept. revenue, embossing are almost certainly revenue. Plain CDS's without those attributes are likely postal as are "squared" circles. Why are parcel cancels considered undesirable? 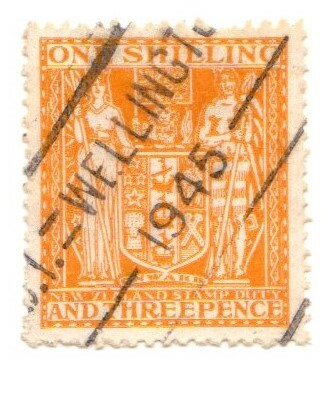 It seems like on the early high value stamps, a heavy parcels cancel lowers the value of the stamp. I would think that given they are guaranteed postal they would be desirable. Do official stamps have revenue usages? I see a lot of the more modern postal fiscals with what looks like a roller cancel - a horizontal line with a location below and a date below that and then another horizontal line. Are these fiscal or postal cancels? Any advice and guidance will be appreciated. A parcel cancellation really does obliterate a stamp and leaves it less attractive than a nice corner CD of course. For those studying parcel post, the cancellations are vital, but there's just not very many collectors of them! For higher face value issues, it's a different story. A parcel post cancellation proves postal use so then becomes more desirable. Could you show an example of the roller cancel on a postal fiscal please? I suppose you have already excluded the obvious blue and purple/violet cancels and non-private company perfins. Plus the postage issues that were used as revenues/fiscals. You'll have to probably have most of a postal cancel on a stamp to prove it's postally used. some of the ones reading "stamp office" and "department" look close to postal types unless you have a reference collection. For the decimal postal-fiscals, the revenue cancels give a region, postal cancels give a town or city/city office. Why are parcel cancels considered undesirable? Less desirable, I would say. It's because they are typically heavy and overwhelm the design. If it's not important to you, that's good because you'll be able to pay much less and fill spots that most others will not. Postal usage of a lot of postal-fiscals particularly those over �1 can be extremely rare. Unless you have deep pockets for those, you may never even see them. And there's the usual warning about forged cancels on those. An example of the roller cancellation I described. Interesting cancel but I couldn't say if it's postal or fiscal. We'll have an NZ expert here I'm sure that can enlighten us both! Are these fiscal or postal cancels? These are roller cancels for Parcel postage. Obviously the machine canceller is of no use. The high value also supports the use. I am coming from an Australian perspective, and have no definite catalogue support for NZ. I'd suggest contacting one of the NZ philatelic clubs. It took 0.4 seconds to lick this stamp.